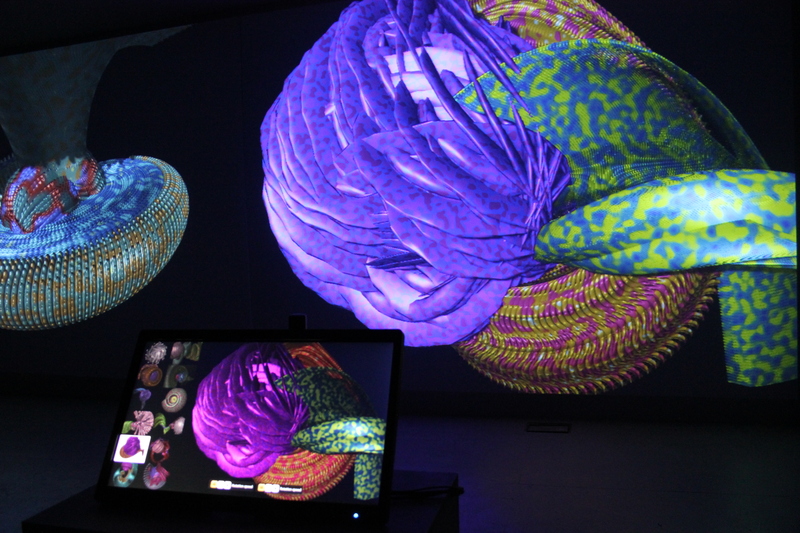 A work created for the Phoenix Show, the Mutator2 Triptych is a novel extension of the core FormGrow grammar showing a virtual world made from horn shapes developed by Latham and Stephen Todd at IBM in the late 80s. Originally designed for mainframe computers, the FormGrow grammar and growth rules have now been re-implemented and extended to operate in real time and interactively in a browser environment. The work references both the American Abstract Colour Field painters where the viewer’s complete field of vision is filled with colour and early Northern European Triptych painting. 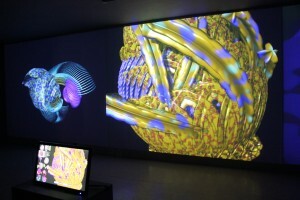 In this triptych, the public can interactively decide the rate of mutation, rotation and zoom of their panel, at the same time taking into account the overall composition across the three screens. Two further points of reference are the Surrealist Art and the spawning 3D content also reflects Latham’s interest in the Rorschach Ink Blot psychological test, where the viewer of the Triptych will similarly bring to bear their own interpretation of these randomly evolving 3D forms, with some sequences in the Mutator2 Triptych perhaps looking like “Escher on acid” or “Giger embryo aliens” or “heavy metal structures” or “Freudian organisms” or however the viewers chooses to interpret these dynamic animating forms. Created and developed in close collaboration with Stephen and Peter Todd (who also created the generative audio) and Tudor Nita from Goldsmiths as well as Fiona MacNeill from Brighton University on presentation and display. 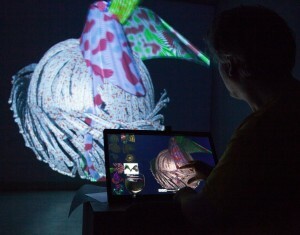 Medium: Computer, Video Projection and Touch Screens. Room 10m x 6m x 3m. 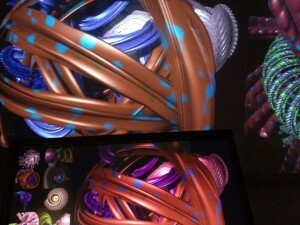 William Latham, Mutator2 Triptych, 2013.